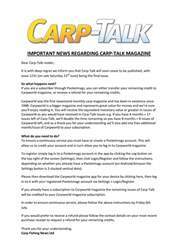 This week’s issue of Carp-Talk (issue 1033) is available to download now. 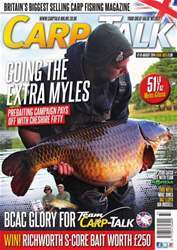 Myles Gibson tops the catches this week with Cheshire’s biggest carp, a cracking 51lb 7oz common. 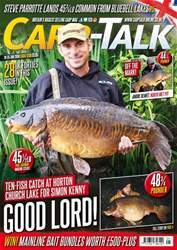 Jon Quinn trips up the biggest carp in France and Bernard Sisson tempts a Cambridge fifty. There’s a full round up of the action in the last BCAC Semi-Final. There’s also a roundup of the 11th British Young Carpers’ Angling Championship eliminators at Oxlease Lake. Ian Russell looks to continue his recent success on Kingsmead One, Team Korda explains how choose the best hooklink for each swim every time, Mike Jones takes advantage of ideal floater fishing conditions. Baz Lloyd demonstrates solid bags are not just for small carp, and we examine several exciting new products from Trakker, Shimano, Fox, Avid, Nash, Sonubaits and DT Bait. 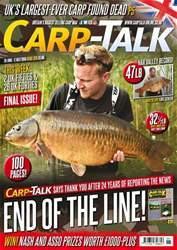 There are great prizes to be won from Richworth Baits, plus the Fox-Mainline Carp Angler of the Year competition continues and the latest prize winners are revealed.